theimaginationmuscle | Birthplace to all ideas:please, let me share a few of my own. theimaginationmuscle Birthplace to all ideas:please, let me share a few of my own. Why Are Little Bees Getting So Much Attention?. My Friends: Thanks for loving me. You are missed..
Dinahmite, always out front and Tigerbuddy, her partner lurking. In March 2013, Dinahmite was diagnosed with congestive heart failure. We celebrated her 13th birthday in May. July 11,2013 Dinahmite passed. I will be forever grateful for our adventures shared. In August of 2014, Tigerbuddy was diagnosed with Cushing’s disease. The vet gave Tiger a medicine called Vetoryl 60mg. Give 2 capsules once a day. Sunday, September 14, 2014 at 10:15AM when Tigerbuddy went to play with Dinahmite. Tiger had a horrible reaction to Vetoryl which in turn hastened his death. To whom may read this: Cushing’s disease in dogs can be treated with proper guidance and your dog friend can live years more. I have not been very active on my blog due to too much to list. Bees deserve respect and care from us humans! They care for us far more than thought is given to the bees themselves. Bees have to be among the most misunderstood creatures on earth. People either love them or hate them. We all know that they make honey, and we know something of their social behavior, especially how they retaliate when agitated. Some people, especially those who are allergic to bee stings, avoid these buzzing bugs at all cost. Others raise them for the honey and still others study them scientifically. As the scientists gather more information on bees and their contributions to society, we are hearing more and more about how these creatures contribute to our well being. The scientists have also released information on the dwindling number of bees and the possible causes of their demise. 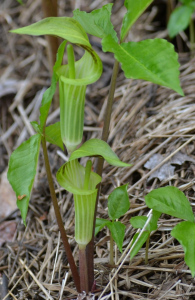 As a small child, I was encouraged to eat the bulb/root of a Jack-in-the-pulpit by my grandfather and father. Pain for days and no understanding of why they both were so cruel. Two-tiered testimony These young Jack-in-the-pulpit plants (Arisaema triphyllum) were growing like a double-decker dais for delivering wildflowery speeches. Incidentally, I always thought that this photo would look good as an impressionist painting. Some photo programs (including the one that I use – GIMP) have “filters” that will supposedly produce this effect, but I have not been able to get it to work.